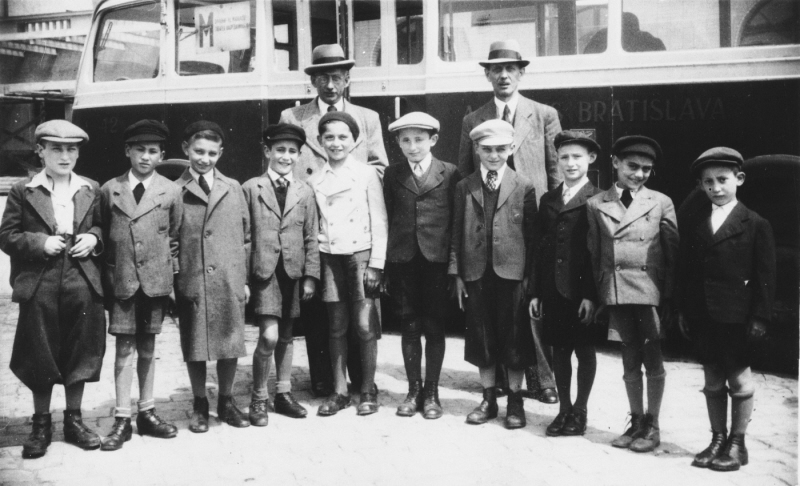 The children were boarded in groups by age and Michael Bloch, not quite six and holding tight to a small suitcase and a cloth bag containing tilsiter cheese sandwiches and lemon sours, was one of the first to board. Older boys bumped past, commenting on the smell of the cheese. He clutched the bag with both hands, afraid it might be ripped from him. The trip from Frankfurt to Amsterdam was long and he slept most of the way. Once there he and the other children were transferred to the ship that would take them to a new life in London. Now almost forty years later, as the taxi from Schiphol enters the center city, he is unexpectedly filled with a feeling of triumph, as if he were a soldier liberating Amsterdam at the end of the war, rather than a biologist attending a conference in 1980. His fragmentary memory of Amsterdam is as a way station to safety. In London he was placed in a foster home and taught English. Then, in the spring of 1942, he was told he had an aunt—Bess Weintraub—who was going to take him to America. No one knew where his mother was. “We knew you had been put on the Kindertransport,” Bess would later explain to Michael, “and we just kept searching, kept writing, until one day we found you. It took years. A miracle.” There was a second miracle: In his bar mitzvah year, Bess told Michael that his mother had been found alive. She had spent most of the war in a concentration camp, and was now living in a displaced persons camp in Friedrichstort. The arrangements seemed to take forever, but in the fall of 1947, Lillian Bloch reached Baltimore. These memories return in a rush on route to the Amsterdam Hilton and serve to give the trip a buoyancy beyond the staid conference. The big man sitting next to him at the conference holds out his hand. Bloch knows of him—a flavor chemist whose textbook is used in many universities. A professor at the University of Utrecht, Apperson consults with flavor houses around the world, helping to develop new scents for products ranging from perfumes to dog food. His ability to parse the elements of virtually any scent is legendary. Bloch feels lucky to have found a seat next to him. Apperson is tall and thick with deep-set blue eyes and bushy gray hair, looking older and less tailored than the picture on the dust jacket of his textbook. Rumpled, Bloch thinks, like a wad of paper snatched from the wastebasket and smoothed out. “I don’t think I have the patience to teach,” Bloch says. Bloch tenses for a second, tells him he’s aware of it. Bloch nods, understanding that this walk is not merely to stretch their legs. He is shivering in the icy dampness of the fall evening and wishes Apperson had opted to have this talk in the warmth of the hotel bar. He wonders if Apperson somehow knows his background. The shiver that follows is not only from the cold. The vastness of Vondelpark is apparent even at night. Bloch notices evergreen, elm and weeping willow silhouetted against the orange glow of city lights. There are ponds, statues surrounded by flowerbeds, and broad meandering trails. Apperson smiles. “Yes, and this late in the year. Those smells drove me to distraction when I was young,” he says. “It was an untrained nose, this thing I make a living from now.” He touches his broad, flat nose, and they walk silently for a few minutes. They walk without talking to a long-forgotten city father memorialized in bronze, fixed on a concrete base and surrounded by a bed of hearty flowers. Apperson stops under the statue and turns to Bloch. “You were so young. Why after all these years?” Almost immediately Bloch realizes that silence would have been a more appropriate response. He doesn’t know which sad war story he is about to hear. He is sure it was difficult, that Apperson suffered. But he’d been an innocent bystander, Bloch thinks, rather than a target, and that makes all the difference. While part of him wants to change the subject and run back to the hotel, he feels drawn to this man. Apperson, at most a couple of years older than he, experienced the terror of the war as a young boy from a vastly different angle and Bloch finds himself eager to compare, to judge. “No, go on. I assume that’s why we’re talking.” So there it is, Bloch thinks. Cards on the table. Apperson smiles and they continue walking. The trees collect the mist, holding it up, out of the way for these two men. “You knew what was happening to them?” Bloch asks. They follow a path that takes them around a large black pond with a small, grassy island in the middle where seagulls huddle in the grass, waiting out the night. Bloch knows what was in store for Apperson’s friend. Unlike his own long ago train ride in the opposite direction that saved his life, Bloch knows what was at the end of David’s train ride. Apperson leads him out onto the street, under the black metal filigree of the archway that serves as one of the entrances to Vondelpark. Bloch considers telling Willem about himself and how he had escaped the war, balancing his story against Willem’s. He decides to wait. There may be a more appropriate time. Narrow houses sharing outer walls join in long rows. Stonework, window treatments, the color of doorways, pediments, these are the things marking one row house from another. Apperson guides Bloch down a quiet side street, stopping at a building much wider than the others. Bloch notices the thin horizontal strips of white brick every two or three feet that divide the red brick of the synagogue. Above the entry are two large windows shaped like the two tablets Moses brought down from Mount Sinai. Above that, a small circular window. Bloch steps between parked cars out onto the street to see the window more clearly. There is a Star of David in the stained glass. He looks at Apperson. It’s clear to Bloch they aren’t going to get any closer to it than where they are standing, and he wonders what memories Apperson has that would force him to keep this distance from his childhood home. “Spies, yes.” But he tells Bloch his uncle was never caught, never identified by the Gestapo as a resistance fighter. “All this was forty years ago,” Bloch says, knowing that doesn’t make it any easier. Apperson tells him the problems didn’t end when the war was over. They are walking again, across the Willem Witsenstraat Bridge. A small boat with a young man at the helm and a young woman sipping from a can of beer, sneak quietly under them as they cross. “Things got particularly rough near the end of the war,” Apperson continues, his voice low and somber. “There wasn’t enough food. We were starving. I remember having to eat tulip bulbs because that was all we had. No heat. Much of the time no electricity. We burned our furniture to keep warm. My mother couldn’t cope and became unstable. We couldn’t leave her alone.” Here the big man stops and uses a tissue to wipe his eyes. “Many times I stayed with her while my father and uncle were out looking for work or food. She would shout obscenities and try to hurt herself. She’d sob violently hours on end. Eventually, we had to tie her to the bed,” he continues, in a soft voice. They walk past a brightly lit pastry shop with a statue of a rotund, smiling baker, hat somewhat askew, standing near the entrance. Apperson asks if he had family who died in the Holocaust. The question takes Bloch off guard and he answers it truthfully, almost against his will. Once Bloch tells him this much, he decides to tell Apperson the whole story: how he was saved, transported to England, reunited with relatives and ultimately, after the war, with his mother. Apperson stares silently at him, and Bloch wonders whether he’s thinking about his friend, David. “Different perspectives,” he begins to say, but then stops. “If it helps you to talk about it, Willem, then I want you to talk.” Bloch continues to wonder why Apperson is tortured now. He was a young boy who didn’t raise a hand against the Jews, an innocent bystander. “A handful of Jews had survived the death camps and some found their way back to Amsterdam. My friend, David, and his mother were among them. They went to their apartment and found strangers living in it. Perhaps they had rights, but they had no money to pursue them. There was no system in place—at least not early on—to address this issue. Their only assets were the apartment and what was in it, and now someone else laid claim to those things. “Look,” Apperson adds attempting to shake off these memories, “I need some coffee. I know a place not far from here. Come.” The small coffee shop is overheated, almost empty. Apperson brings two coffees to their table and sits down. “Have you tried to find him?” Bloch asks. Apperson tells him he and other friends had wandered the neighborhood for weeks hoping to catch sight of him. But David was never found. Apperson says he’s working his way through that issue with his therapist. No, he hasn’t tried. Not yet. “Look, sorry, but you’re the one who wanted to talk. You’re going through a hard time and I don’t want to make matters worse. But I guess I see this more from David’s perspective.” He tells Apperson how difficult it was for his aunt to find him during the war—how long she searched. They walk back to the hotel without speaking. A fine mist begins to fall, the wind whipping it into their faces. The bright lights of the approaching hotel squeeze the past from Bloch’s consciousness, like water wrung from a woolen sock. When they reach the Hilton, he tells Apperson he’ll see him in the conference room in the morning. Bloch has a restless night. The conversation with Apperson has left him with an uneasy feeling, as if something important had been left out. Why was this man in therapy? It occurred to Bloch that perhaps Apperson was more than a bystander. What if the German soldiers had enlisted Apperson and some of his friends to find Jews hiding in the park? What if this frightened eight-year-old led the soldiers to where David Adler was hiding? A young boy, apprehended by invaders in a place he shouldn’t have been, could easily grab hold of the deal the soldiers were offering: Find us a Jew and we’ll let you go. Is that what haunts Apperson? After the session the next evening, Bloch decides to walk into Vondelpark on his own. This time the moonless sky is clear. It is darker than the night before when the city lights were refracted by the mist. This is a more mysterious park, a park with secrets. Bloch wonders if it is possible for soldiers to find a child hiding in this park, a child who knew the ins and outs of the place. A door opens behind him at a cafe just outside the park, accordion music and laughter spilling out. He walks deeper into the darkness, following an asphalt path. He imagines Apperson claiming the boys weren’t hiding, that the soldiers surprised them, rounded them up and interrogated them. But Bloch is not convinced. He imagines seeing the young David scurrying behind one tree, then another, and the German soldiers thrashing the bushes with their bayonets. “There, over there,” one of them shouts. He can feel David’s fear and horror at that moment, and he wonders if he’ll ever discover what Apperson saw and felt in the Vondelpark of his youth.